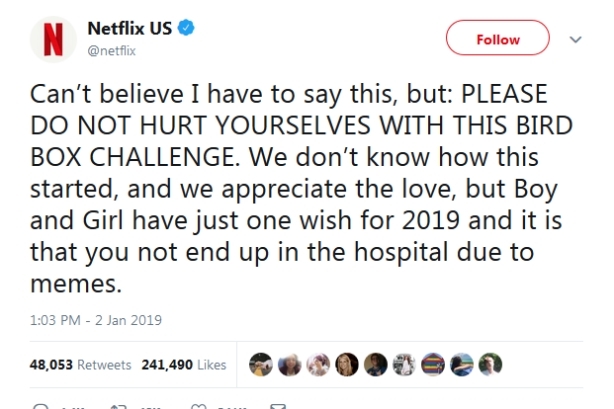 The streaming service tweeted a message warning people not to hurt themselves with the latest dangerous social media dare. One year after Tide enlisted Gronk to dissuade teens from participating in the Tide Pod Challenge, Netflix’s Bird Box film has, too, become part of the growing list of idiotic social media dares. The Bird Box Challenge requires participants to attempt to do things – such as walk on stairs and drive – while blindfolded, like Sandra Bullock’s character in the horror film. Last week, media outlets such as HuffPost and Inside Edition reported that the challenge was going viral. On Wednesday morning, Netflix tweeted a message warning people not to hurt themselves by doing the Bird Box Challenge. The tweet has garnered 47,375 retweets, 238,000 likes, and over 4,000 comments. Should Netflix have turned a blind eye to the Bird Box Challenge? Or was the streaming service right to tweet out a warning? Did Netflix need to tweet about the Bird Box Challenge? Did Kevin Hart need to step down as Oscar host?